Trust your quilt to an Award Winning Quilter with 40+ Years Of Experience. Your satisfaction is Guaranteed with Quality Workmanship at Affordable Prices. We maintain a clean, healthy, and safe studio environment – No Dust, Smoke, Odors, Bugs, Pet Hair or Smell. Customer's quilts are kept in their own box clean and fresh which also protects them from loss. In addition, our studio has a Security System to protect your quilts. What does all this mean to you? Your quilts will be returned to you clean and odor free. We appreciate all the hours of work you put into making your creation so we want to ensure your quilt is protected while entrusted in our care. Catherine Kessel, business owner, has been an amazing Award Winning Quilter for 40 years and is a professionally trained 2001 graduate of Longarm University™. "Our business is not a hobby. It is our sole source of income and therefore, we operate it as a genuine small family-owned business"
and specialize in freehand style (not computerized) stitching which provides for distinctive and custom quilting designs. Our machine has a 14 foot table large enough to accommodate California King Size quilts up to 120" or larger. We will also make custom quilts to order. Finished quilts make great gifts for babies, weddings, anniversaries, graduation and birthdays. We specialize in making custom Family Memory or T Shirt Quilts. Contact us for a price sheet. Our specialty is to work on appliqué, medallion, "round robin" and T-Shirt quilts. 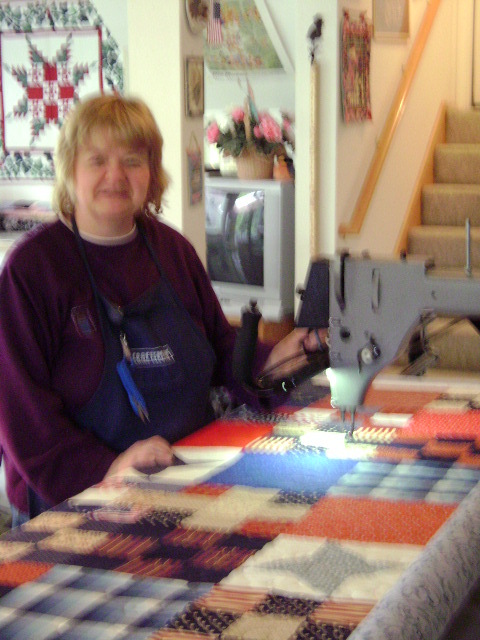 We are also a designated longarm quilting studio for American Hero Quilts. Look at our photo album filled with pictures of customer quilts and quilts designed from our Studio. Check out our Facebook page for lots more photos of customer quilts and testimonials.